This contemporary history, based on the latest scholarly research, offers a balanced perspective of the continuing legacy of Maoism in the lifeways not only of China's leaders but China's working people. 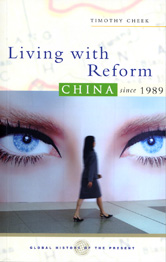 It outlines the ambitious economic reforms taken since the 1980s and shows the complex responses to the consequences of reform in China today. It shows the domestic concerns and social forces that shape the foreign policy of one of the world's great powers. It will equip the reader to judge media reports independently and to consider the experience and values not only of the Chinese government but China's workers, women, and minorities.